This isn’t the kind of blog entry that I usually write but with the latest series of Doctor Who just having finished on Saturday, I thought this might be the perfect time to talk about how much I like Peter Capaldi’s Doctor. And I mean I really like him. This last series, in my opinion, has been one of the best in all of the show’s history. I’ve spoken about my five favourite Doctors in the past, and if I were to do that again, the Twelfth Doctor would certainly be one of them (though I’m not sure who he’d replace). In fact, I’d go as far as to say, that if his Doctor stays this good (or even, my goodness, gets even better) throughout the rest of his era, he might even take Patrick Troughton off of the throne he’s enjoyed in my heart for some time. 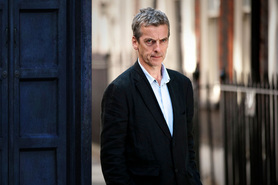 What’s interesting is that the Twelfth Doctor is nothing like the Second Doctor. The Second Doctor is always very friendly with everyone and just a generally lovely person with lots of charming child-like attributes. The Twelfth Doctor, meanwhile, is outwardly not very friendly at all. He doesn’t bother to try to be ‘nice’ and often seems very detatched, maybe even uncaring. But I think the truth is, that despite his rather aloof demeanour, he cares very much for his friends and is a very forgiving, very moral character. Yet he doubts himself a lot, he needs reassurance that he is indeed a good person, as if he believes he is the person he pretends to be. This is a Doctor who always wears a mask, the mask of an unlikeable person. Why does he wear it? Well, perhaps he really doesn’t believe that it is good for people to become attached to him. But every now and then we get a glimpse of what lies beneath the mask and it is absolutely beautiful.